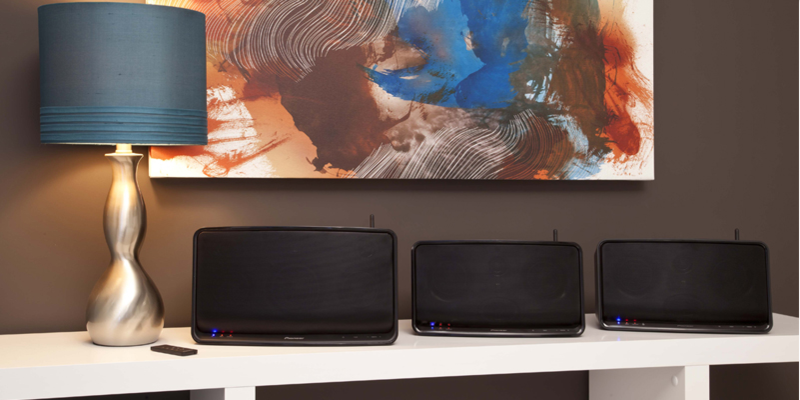 Pioneer Electronics showcased its new line of tabletop Wi-Fi speakers today at the CEA Line Show in New York City, emphasizing mobile connectivity as your primary source of entertainment. Utilizing a technology called Wireless Direct, you can sync your smartphone directly to the speaker without having to dock the device. The expansion of Pioneer’s line of speakers include three models, the Pioneer XW-SMA1, XW-SMA3, and XW-SMA4. Though all models contain dual 77mm woofers, 20mm tweeter, and dual 10w + 10 w amplifiers, only the A3 is truly wireless in that it uses a rechargeable lithium ion battery to make the speaker completely portable. The matte finish is water resistant, making it great for taking along to the beach this summer. All three models also have a range of 300 feet, so you can be in an entirely different room and send wireless control to your speakers. We can’t help but envision the kinds of pranks you can pull as a host as your guests jam to a song, only for you to change it on them. Pioneer representatives also emphasize the need to make all three models of the SMA speakers connect to your mobile devices seamlessly because they believe the digital culture has moved their entertainment center onto the smartphones. So, in addition to Apple Airplay, Digital Living Network Alliance (DLNA), and Bluetooth connectivity, Pioneer has also partnered with HTC to make HTC Connect a branded support in its entertainment products going forward. Whether you’re an Apple or an Android, you can still enjoy quality sound wirelessly without arguing over whose operating system is better. The Pioneer A1 will ship in August starting at $300, while the A3 and A4 is priced at $400.